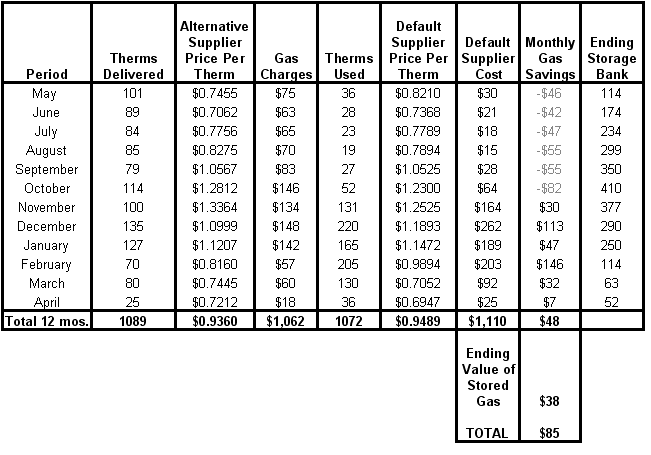 Last month, I had written a post about my costs for natural gas to determine whether or not I was saving any money with my current plan…and whether or not I could save more. As I had ended Part 1, I was waiting for the full accounting from my current supplier who was sending me a “management report” which would conceivably show me how much I had saved or lost with my plan versus the “default supplier” for our area. Like I said, not overwhelming on an annual basis, but at least an extra nice dinner out each year? I’ll take it. Essentially, you pay for additional gas in the summer months at a lower cost and store it up to be used in the winter when costs are higher. An obvious question is “why don’t you buy ALL of it during the summer?”. I asked the same question and was told there are imposed limits (30% of anticipated need) on how much can be stored for each individual account. Too bad. So, the final portion of my analysis is to determine whether or not anyone can provide even better savings than what I have today. Based upon what I had seen from the analysis provided by our state watchdog group, I am not encouraged. In fact, I’m a bit scared. What I mean by this is that if I do find something that looks appealing, I’m going to be wondering if it truly is a deal or I’m just setting myself up for a fall. I guess we’ll just have to see. I’ll post my analysis and finish up my work in this area sometime later this week.